I don't often make meatballs but when I eat them I wonder why don't I make them more often. My friend Sasha had made meatballs the other day and it made me think of how much I fancied some. It's not hard work but it does take a little bit of prep. The *roasted garlic in the meatballs takes them to a whole different level but it does need to be cold before adding to the raw meat. Start by wrapping the garlic bulb loosely in foil, drizzle a little oil and roast in a preheated oven @170˚c for 35 minutes, leave sealed in the foil to cool completely. Whizz the bread and rosemary leaves in a food processor until you have fine bread crumbs. 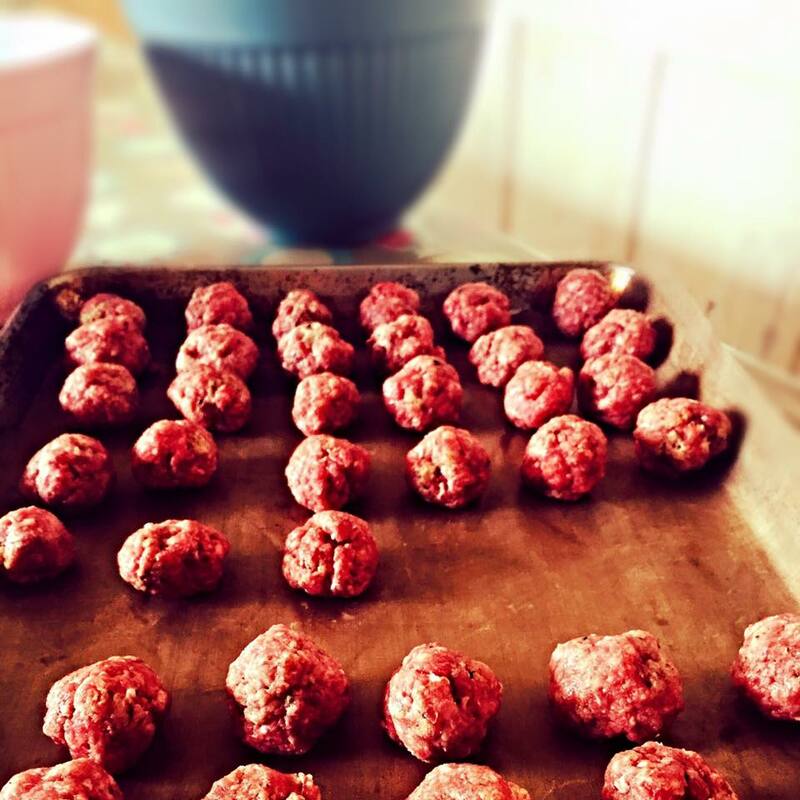 Tip the rosemary breadcrumbs into a large bowl, add the rest of the meatball ingredients into the bowl. Squeeze the roasted garlic into the bowl. Use your hands to mix together until combined. Wet your hands and roll walnut sized balls, pop onto a large lined baking tray, cover and chill for an hour or up to 24 hours. Chop the tomatoes in half and deseed the peppers and chop into quarters. Peel the onions and cut into quarters, chop the chilli into slices, tumble everything onto a baking tray, drizzle with the garlic oil, season with the salt and pepper and sprinkle with basil leaves, roast in a hot oven 200˚c for about 40 minutes, until the tomatoes start to charr slightly. 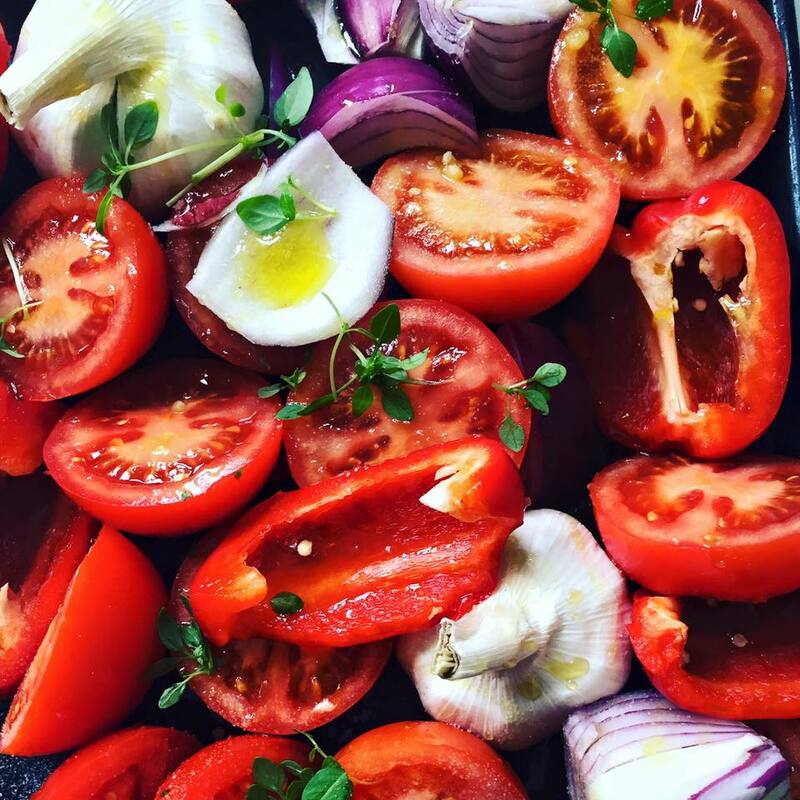 Cook the chilled meatballs in the hot oven 210˚c for about 25 minutes, spoon all of the roasted veggies into a food processor add the tomato paste, sundried tomatoes and 50g parmesan, blitz until smooth. 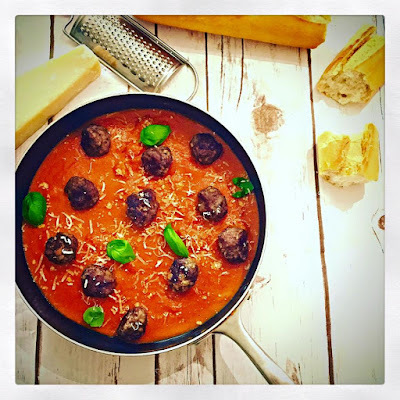 Spoon into a pan add the tinned tomatoes, reheat until hot, add the cooked meatballs to the pan, serve with either rice or pasta, some parmesan cheese and a sprinkling of chopped basil leaves.